When it comes to selling precious stones and jewelry, sapphires are one of the most sought-after precious stones on the market. If you are searching for the best place in town to sell sapphires, without them being evaluated much less than they’re worth, you’ve found the right place! Here, at NYCBullion, you will receive high-class free appraisals from our qualified gemologists and reputable jewelers that will authenticate your sapphire assets right in front of you, to ensure complete transparency and full acknowledgment of your sapphires’ value. We use only official licensed scales and grade your sapphires according to the most important factors: color, carat weight, cut, treatment and country of origin. We ensure you that you will receive a personal, comfortable and secure experience when selling sapphires, here at NYCBullion. Stop visiting unreliable pawnshops. Come to our location in the Diamond District and we guarantee you will leave our store smiling with a generous cash for sapphires payout in your wallet. Our location can be found in the center of NYC, Manhattan, in the Diamond District. Visit us to receive a free appraisal of your sapphire jewelry or stone. When you sell sapphires, it is crucial to feel 100% confident that you are dealing with a trustworthy buyer. Our certified team of professional jewelry and precious stones assessors will authenticate your sapphires right in front of you, making sure you get the most accurate evaluation and detailed information about your assets. Stop by our reputed store and we guarantee you will be satisfied with your selling experience, receiving the most honest and fabulous quote for your sapphire belongings. If you are wondering how to sell sapphires easily and safely at the same time, visit us – NYC Bullion. You can choose to complete the “Get an offer now” form on our website, and receive an online appraisal of your sapphires, stones, or jewelry. Or, if you prefer a more personal live assessment, simply visit our store in the heart of NYC, the Diamond District, and get your sapphires authenticated by our top-notch gemologists and jewelers. The evaluation of your sapphire assets is a free, fully transparent process that will determine the real value of your precious sapphires in no time! So forget about pawnshops and local jewelers that will quote you an undervalued price - fill in the offer form or come to our store to get the most pleasant experience when selling your sapphires. Sapphires can be found both in vintage and modern jewelry. Sapphire rings are, by far, the most popular jewelry item containing this precious stone. Sapphire engagement rings have been a symbol of love for hundreds of years and are usually chosen by the royalty and upper echelons of society. However, sapphire necklaces and earrings are more common due to the incredibly beautiful blue color look of the sapphire stone. The color of the stone is crucial when determining its sapphire’s value – vivid-colored sapphires cost more, but they are extremely rare. Moreover, most sapphires are heated at high temperatures to remove the impurities and improve their color, but this process affects the value of the stone or the sapphire jewelry. Sometimes, sapphires are paired with diamonds in jewelry, because they complement each other and can create extremely valuable pieces. 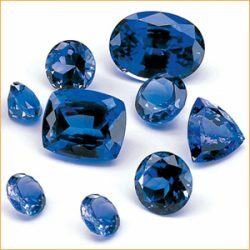 However, just as other precious stones, sapphires have also been produced synthetically. A synthetic sapphire differentiates from a real natural sapphire stone – it doesn’t have flaws, its color is clear and intense and is perfectly shaped. Please keep in mind that we give cash payouts only for real sapphire stones and jewelry.